Today’s post is sponsored by Greenworks. They’re generously hosting a giveaway for YOU! As always, all opinions are our own. Are you looking for eco-friendly outdoor tools? Greenworks has you covered with their variety of tools that are easy on the user, ecosystem and wallet! If you’ve been following our journey for awhile, you’ll know I (Kelli) purchased our childhood home several years ago. Our dad and uncles built this house that we were born in. But since we’re number six and seven of nine children (yes, 9, that is not a typo), our family outgrew this little farmhouse so our parents built a bigger one next door. In the 8 years that my little family has lived here, we’ve remodeled several room and completed a ton of amazing projects. 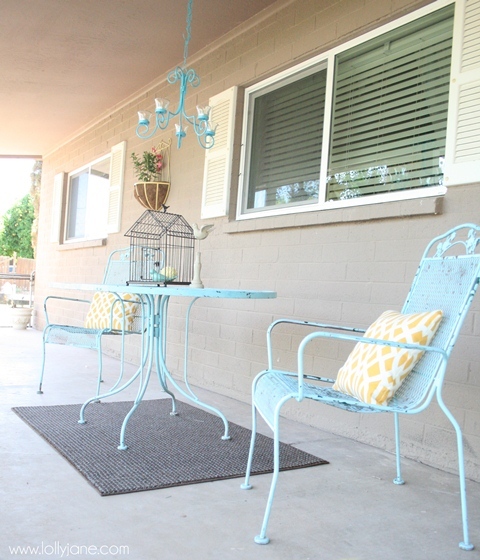 Let’s take a tour of the long way our popular front porch has come, shall we? Don’t forget to scroll all the way down for the big giveaway! Ahh, our lovely brown home. My mom actually asked my advice when picking a paint color for the rental. (When they moved out, it became a rental property for about 30 years before we bought it.) I definitely, absolutely told her NOT to go with this color. Clearly she ignored me. 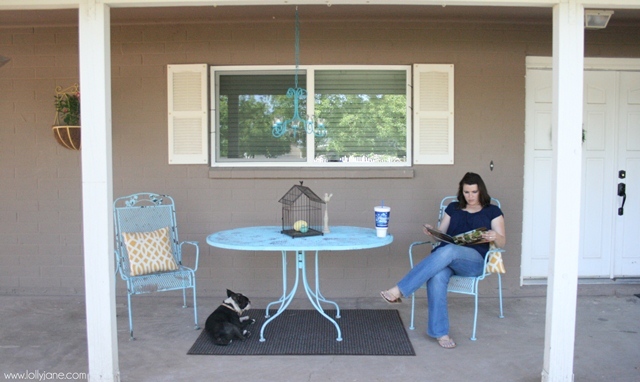 After a couple of years and saving up some cash, we were able to paint the whole house a fun shade of blue! I actually color matched it to an old bench my husband found on the side of the road. I still remember him sending me a picture of it shoved into his squad car from work, he knew I would love it. 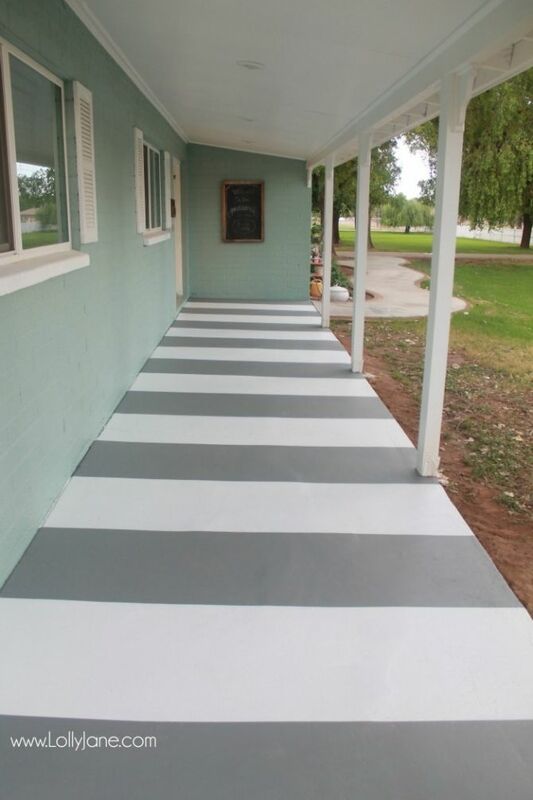 The concrete was screaming for a makeover too so we painted it white then added thick gray stripes. We’re on a county island, no one cares what we do out here so why not? 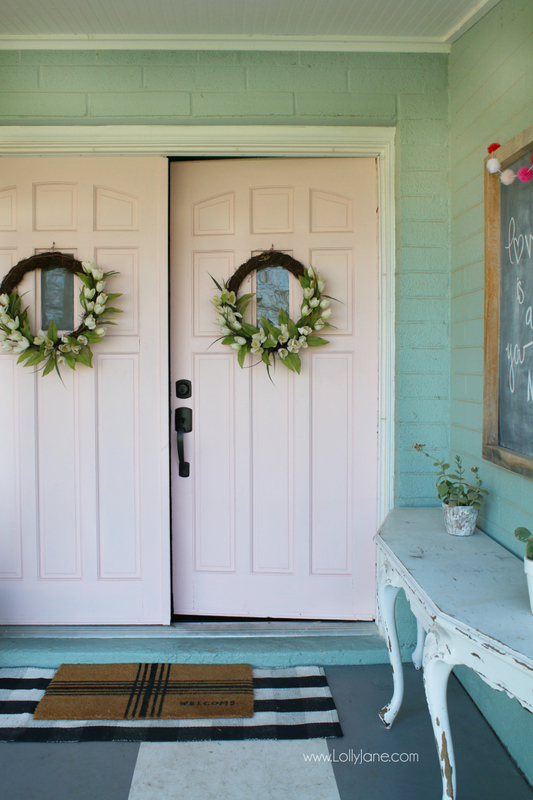 The door went from its original stain color to white, then yellow, then coral, then navy, then red and now light pink! 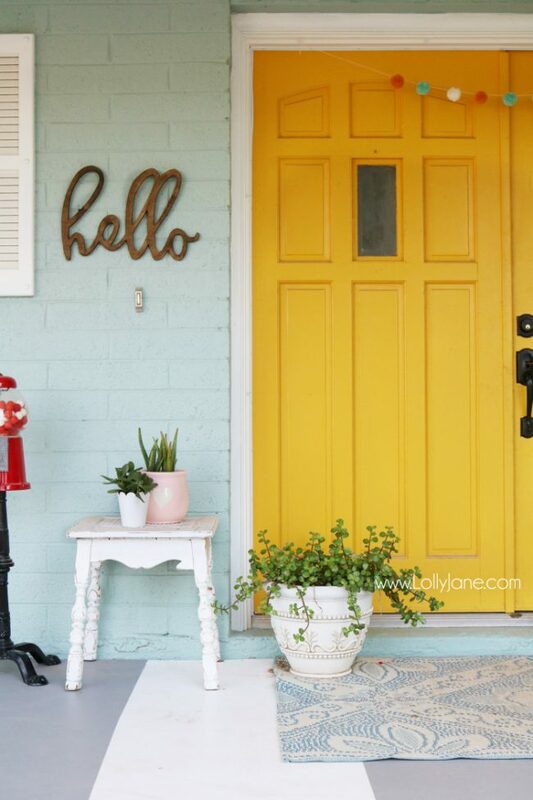 We’re getting ready to install dutch doors and I can’t decide on the final color: it’ll either be mustard yellow above or pastel pink below. Which would you choose? We love the house color, whew! One thing checked off our list. But do you see all this land? We’re blessed to have an acre and a quarter to raise our children on. Lots of family time in the yard whether it’s the fun t-swing our dad built, the trampoline or lacrosse, this grass gets lots of love! Which means it gets lots of work. Do you know how much work it is to keep up an acre of land? A LOT. We need strong tools that can handle the job. Our 14 year old son does the mowing, our 12 year old son tackles the weed eating and the girls take care of blowing the driveway, sidewalk, 2 huge porches and the weeding. Greenworks has you covered with everything you need AND it eco-friendly! No gas, no fumes, no fuss.We know you want to try them out so guess what…. Greenworks tools is graciously hosting a giveaway, along with The Handmade Home, Thistlewood Farms and Remodelaholic. Three lucky people are going to win $300 each towards Greenworks tools of their choosing! To enter, simply jump over to the Greenworks tools Instagram site and follow them. Then ‘like’ the giveaway image (similar to the above image) and you’re entered. Want more chances to win? Simply tag a friend in their Instagram post. Every friend you tag gains you another entry. So like the photo and tag 10 friends, you get 10 entries. Tag 15 friends and you get 16 chances to win! See how that works!? The contest winners will be picked on 2/1 at 3 pm EST. Tag as many as you want until then. May the luckiest of ducks win, and we can’t wait to share more with you about these fun tools! Be sure to check out the Greenworks tools at your local Lowes. Good luck, friends! An acre of land! You will need some tools. 🙂 Love your post today friend! Love the color you chose for the house!! We recently moved up from one acre of land to 10 acres I can’t wait till my kids are old enough to mow the lawn and handle the weed eater! !